John Thorn, acclaimed historian and author of Total Baseball and many other titles including Treasures of the Baseball Hall of Fame, has probably contributed more than anyone to putting the Knickerbocker’s 1846 match into its proper perspective. As the preeminent sleuth of the early game, he has documented baseball’s beginnings back to Pittsfield, Massachusetts in 1791 and earlier. His knowledge of the game and the institutional collections that have helped preserve its history are unmatched. So are his discoveries. Since its donation to the New York Public Library in 1921, the A. G. Spalding Baseball Collection has played an important role in the establishment of baseball research as a scholarly endeavor. Dr. Harold Seymour’s 1956 Cornell University dissertation on baseball history blazed the trail, citing the Spalding Collection as an invaluable resource. Today, Thorn continues that tradition with his much-anticipated book on the game’s origins, Baseball in the Garden of Eden. In studying the history of the game, Seymour and Thorn have also helped to document the Spalding Collection itself. Sadly, their important work has also revealed that the great collection featuring the archives of baseball’s first historians—-Henry Chadwick, Harry Wright and Albert Spalding—has been victimized by considerable theft and vandalism. Thorn was kind enough to grant us this exclusive interview to talk about the collection and his discovery that the score sheets from the historic match played by the Knickerbocker Base Ball Club in 1846 are missing. HOS: John, everyone in the baseball research community eagerly awaits your upcoming book Baseball in the Garden of Eden, and I’m sure you have many new discoveries to present in the ever-fluid arena of scholarship regarding the game’s origins. There was a time when the date of June 19, 1846 was considered ground zero in the evolution of organized baseball. 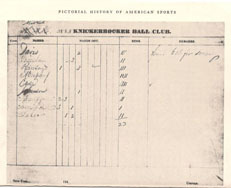 Historians like Dr. Harold Seymour and John Durant included in their works images of the actual score sheets from that game, referring to them as the baseball’s “first score card” and “first box-score.” With all of the recent data uncovered in your research does the first match game of the Knickerbocker Base Ball Club still carry the same significance as it did in the past? JT: No. I think the game of June 19, 1846 was an intramural affair of the sort the Knicks regularly played, and was inflated to a match game some years after the fact through the penned annotations of James Whyte Davis, who did not join the Knickerbockers until 1850. The first Knickerbocker match game truly (i.e., in a game against a distinctly separate club) came against the Washington, later renamed as the Gotham, on June 3, 1851. But the first match game of baseball did not involve the Knickerbockers at all–it took place on October 11, 1845, between the New York and Brooklyn clubs (reported in the press on October 13). Did they play by Knickerbocker rules? Probably, in that the Knick rules were hardly original with them, dating instead to William R. Wheaton of the Gothams in 1837. HOS: Those score-pages originally appeared in books by Seymour and Durant courtesy of the New York Public Library’s Spalding Collection. Seymour and his wife Dorothy were researching in the collection as early as the 1950’s. When did you first utilize the Spalding Collection in your own work? JT: My first visit to the Spalding Collection came in 1983. HOS: As a resource, how important is the Spalding Collection to the baseball researcher? JT: Invaluable–for images, scrapbooks, diaries, game books, club books, and the allied NYPL collections of Bradshaw Hall Swales and Leopold Morse Goulston. Most of the images are online now, but the textual materials are accessible only through microfilm or an in-person visit. HOS: The collection includes the Game Books and Club Books of the Knickerbocker Base Ball Club. Based upon your own research, how did these historic volumes make their way into NYPL’s possession? JT: The line of descent is pretty clear—from James Whyte Davis, who took possession of the Knickerbocker materials after they disbanded in 1882, to Henry Chadwick to Albert G. Spalding to the NYPL. Death was the transmission event in each instance. HOS: In 1983 the New York Times published an article about your spearheading an effort to microfilm and help preserve the majority of the manuscript holdings in the Spalding Collection? How did that come about? How successful was the project? JT: Upon my visit to the Spalding Collection and my expressed desire to view the Harry Wright diaries, I was informed that these volumes were no longer available to researchers because the ink had started to fade from occasional exposure to artificial light. I asked whether this material had been transcribed or microfilmed and was informed that the former was too labor intensive and the latter would be at least fifteen years in the offing, as other projects, evidently more worthy of preservation, were lined up ahead of the Spalding Collection materials. I asked if the Spalding materials would jump to the head of the line if they were funded by outside underwriting, and was told that there was a good chance. So I lined up four backers—the Baseball Hall of Fame, the Sporting News, SABR, and myself—-to pay the freight for microfilming the Knick books, the Wright diaries, the Chadwick and Spalding Scrapbooks. Each of the four underwriters obtained a full set of microfilm, which was great, but the true satisfaction lay in preserving these unique manuscripts and scrapbooks for future generations. HOS: Your work has yielded some of the most important discoveries ever made about the early game. However, there’s one discovery you probably wish you didn’t have to make. Tell us about how you first discovered that the original score pages from the historic June 19, 1846 match between the Knickerbockers and New Yorks were missing from the NYPL’s Knick Game Books? JT: On my original visit to the NYPL, I had paged through the Knickerbocker Game Books specifically to glean information about the players named, and the number of men to the side. When I went back to the microfilm I was surprised to find that the game of June 19, 1846 was not present, nor was the second game played that day, whose date had erroneously been “revised” to June 20. Inquiring of an NYPL staffer about this I was informed in writing that in the microfilming process the “second game” had been missed, and I was supplied with a clear photocopy. But there was no comment about the absence of the game of June 19. I returned to the NYPL in about 1987 to view the game books again, and saw clearly that the page on which the June 19, 1846 game would have been recorded had been excised by a razor blade or Exacto knife. HOS: Some might still consider those score-sheets the most significant baseball artifacts in existence? Based upon what you’ve seen other early documents of the game sell for, what would you consider the value of those missing score sheets? JT: Some years back, when there was universal support for this as the first match game, it would have been worth more than it is today. But one can’t place a price on this any more than one could have placed a price on the Mona Lisa after it was stolen from the Louvre back in 1911. The only person who would buy it would be one who could pay big bucks for an object he could never display to friends. HOS: What would you consider the value of those score-sheets to those studying the game in its infancy? JT: The Knickerbocker game books have not yet been plumbed for all their mysteries—much study remains to be done. And we have good copies available for the June 19, 1846 game, so from a scholarly standpoint, not much has been lost with this vandalism/theft. HOS: Did you report your discovery of the missing score pages to NYPL officials or employees? JT: Yes, on the spot. And I had previously reported in writing the absence from the microfilm of the June 19, 1846 games. HOS: In the decade after your discovery, were you aware of any investigations that the library conducted about the missing score-pages? HOS: What role did the Spalding Collection play in the research for your soon-to-be- released book, Baseball in the Garden of Eden? JT: Huge—-the notes I had taken back in 1983 I subsequently typed into a word processor (Word Star!) and have converted and reviewed those documents many times over the years so that they represent a continuing source of good raw stuff. And my review of the Knickerbocker Club Books was wonderful for obtaining an understanding of how the number of innings came to be nine rather than the recommended seven, and why Louis F. Wadsworth was repeatedly in hot water with the Knicks. HOS: I know that you made another nice discovery when you examined a copy of the by-laws and rules of the 1852 “Eagle Ball Club.” At that time, the New York Public Library’s copy was missing. How did you come to secure a copy of this pamphlet for your research? JT: I had long thought the NYPL holding of the seven-page Eagle pamphlet of 1852 to be the only one, and I despaired of it ever being retrieved following its disappearance in the early 1980s. I don’t know what prompted me to go to WorldCat and check for it recently, but I was shocked to find a copy at the Chicago History Museum. I made a direct inquiry and the good folks there not only confirmed they had it but provided me with a legible copy, and it proved a revelation, forcing me to rip up what I had already written for EDEN about the Eagle and Knick rules. HOS: In crafting your impressive body of work over the years, what has been your single most important research resource? JT: I think it must be the vastly expanded array of digitized newspapers, from ProQuest to Newspaperarchive to Readex to Gale, and more. While these are not exactly primary sources in terms of research, they are contemporaneous, or more nearly so, with the events described, unlike the work of even the most highly respected historians of the 20th century. JT: If I had to choose one item, it would be the Knickerbocker Game Books and Club Books (OK, they’re technically two items). HOS: Many have had the pleasure of reading your recently published excerpts from Baseball in the Garden of Eden. When can we expect to see your much anticipated work in stores? JT: Spring 2011. Count on it. I’m 100,000 words in with three chapters to go. This is an incredible addition to baseball research. Not to be missed by anyone interested in both the historical record and early artifacts of the game. I think mentioning the Reichler situation in the context of this article is wrong. It makes it look like the programs were intentially stolen and sold, where the real fact is programs borrowed from the hall were not returned and inadvertantly would up in Mr. Reichler’s files which were later sold. thank the Lord for John Thorn. He continues to add to the history of baseball.